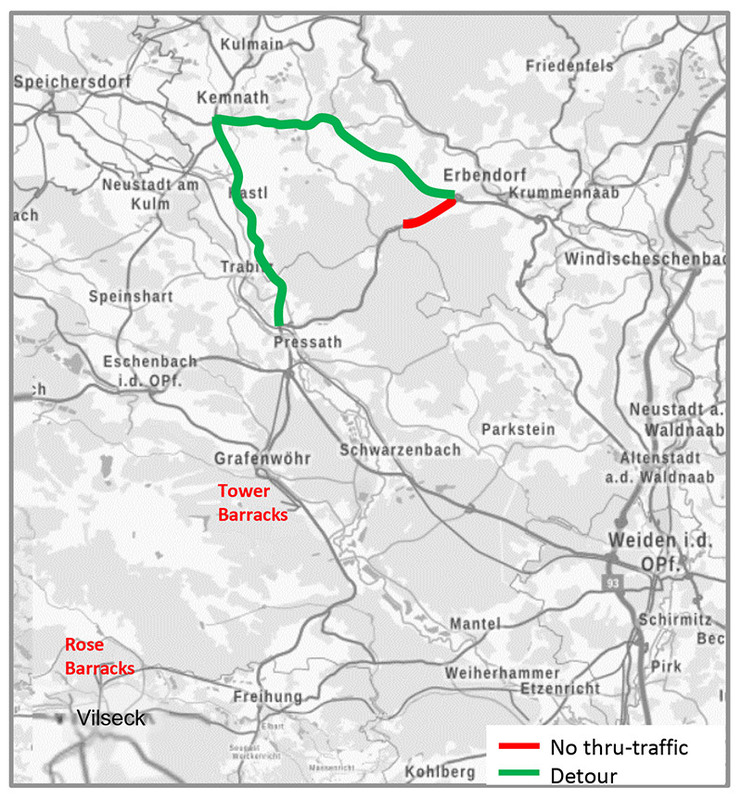 The 3-year construction on the B299 adds 10-15 minutes to the commute between Erbendorf and Grafenwoehr. GRAFENWOEHR, Germany — A road leading from Erbendorf to Grafenwoehr will be closed for construction for three years. The closure of the B299 between Pressath and Erbendorf will result in a detour for those driving to Grafenwoehr. Construction begins at the end of August 2018. The total closure of the road begins Oct. 15. The Bavarian state construction office announced the construction project at a July 11 Grafenwoehr construction meeting. The purpose of the construction is to widen and straiten the road to federal road standards. Currently, the section of the B299 is windy, narrow and potentially dangerous. The construction will impact commuters and school bus routes. Service members, families and employees driving from Erbendorf should follow the B22 to Kemnath, and follow the St2665 toward Pressath and Grafenwoehr. Detour (Umleitung) signs will be posted. The detour adds 10-15 minutes to the commute between Erbendorf and Grafenwoehr. The detour will force school buses to pick up DoDEA students about 5 minutes earlier than previous pick-up times. Students can expect to be dropped off about 5 minutes later. Parents and students will receive official pick-up times from the bus office in mid-August.